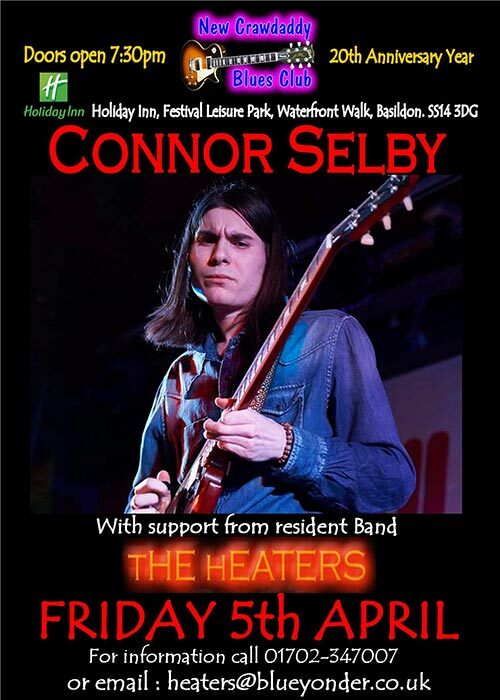 Connor Selby has played the Crawdaddy on many occasions as a support act, but he is now rightly getting the recognition he deserves as a main act, having honed his guitar and vocals skills to perfection with his own band. Connor has been a guitar and music fanatic for as long as he can remember, first picking up the instrument at around age 8. Since that day Connor has been honing and developing his craft for almost the entire duration of his life. Musically Connor takes inspiration from most of the British players that emerged in the 1960s, citing Eric Clapton as his first and current major influence, putting particular emphasis on his output with John Mayall and the Bluesbreakers and Cream. Connor has also studied the guitar playing of other players such as Paul Kossoff, Gary Moore, Joe Bonamassa and of course, BB King, Albert King and Freddie King . Although blues based guitar music has been the most prominent style in terms of Connor's listening throughout the years his musical taste extends much further and deeper than just the blues. Connor's listening also includes a variety of Folk, Soul, R and B, Gospel and Country and Western including the music of Ray Charles, Donny Hathaway, Nick Drake and many others. Connor describes these artists as having a huge impact on the way he listens to and thinks about music. Connor signed with 3MS Music in 2017 and released his debut album "Made up My Mind" to critical acclaim in September 2018. It has been confirmed that Connor and the band will be opening for THE WHO at their “Moving On” show at Wembley Stadium on 6th July 2019, sharing the stage with Kaiser Chiefs and Imelda May. See Connor here at the club first!